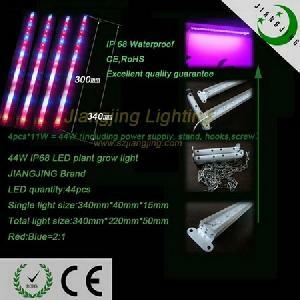 .Waterproof Grow Light is an updated products according with Industrial Standard. comparing with the High Pressure Sodium Lamp bearing 3-5 time power request. .Advanced cooling design ensures perfect cooling performace. 2� temperature difference between the base and surface gives the longest life-span and fully degrades the luminous decay. .603 aviation aluminium materials with finishing surface looks pretty and corrosion-resistant. .The client is permitted to set the different light proportion. And we advise 8:1, 7:2, 2:1 & 1:1 for the red and blue. .9W, 11W, 18W, 22W, 27W, 33W, 36W, 44W or customized one are available.